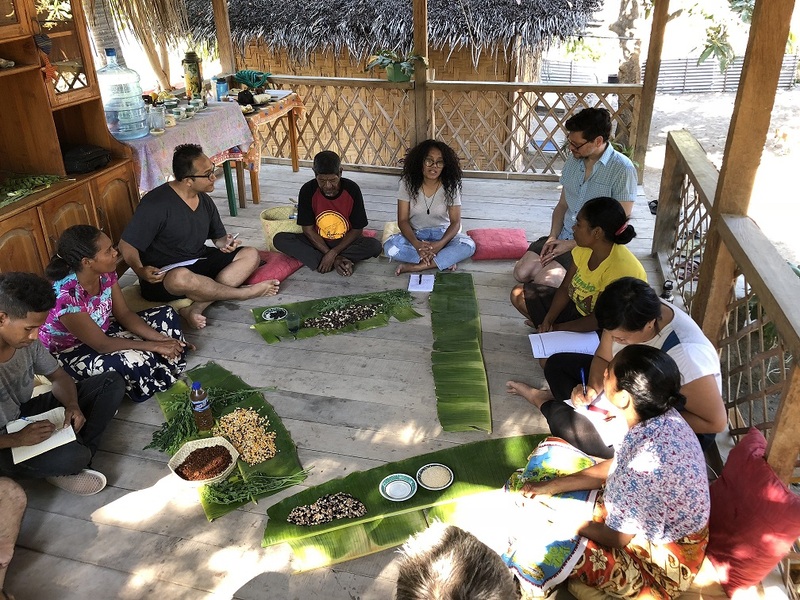 When Canadian food researcher and consultant David Szanto went to Dili in August 2018, he visited LAUNCH Food Innovator TL-FIX and took a deep dive into Timorese culture and cuisine. Here, David describes the people, the stories, and the transforming foodscapes he witnessed. The staff at Agora Food Studio in Dili, Timor-Leste are proud of their budu. And rightly so, in my humble opinion. As someone with a bit of an international condiment fetish, I find these pickled condiments addictive. They are variable and bright in texture and taste, and notable for how they complement Agora’s very well conceived dishes. I have a hard time not eating budu straight from the spoon. A Tetun word that translates roughly as “fermented,” budu refers to any one of a number of spicy sauces or relishes. Picking just one of the offerings is impossible for me, so I always load up a small saucer with a bit of everything, just in case I might miss an incredible taste sensation. Beyond being a wonderful way for guests to customize their lunch plates, the budu bar epitomizes Agora’s ethos. As a social enterprise focused on taste training, skills development, and cultural valorization, the restaurant-café constantly connects a new kind of ecological ethics with the care and hospitality that gastronomy is all about. Ingredients are primarily local, as are the team, the stories and techniques, and the value that is returned to the community. Gestures, ingredients, and learning opportunities are never wasted, benefitting the organization and its staff, their eaters, and the food system as a whole. That tingly lime pickle is made with leftover rinds from the juice bar; the bamboo straw that came with my glass of tamarind-ginger-lemongrass cooler is sustainably made and reusable; the toasty mauve flatbread enveloping eggs and chouriço contains 50% purple sweet potato, making for chewily aromatic—and nutritious—goodness. And of course the glowing, gorgeous coffee beans that are ground up by the baristas for their superior flat whites are all grown and roasted in Timor-Leste. When I wonder aloud how long the budu needs to ferment, and what goes into them, I am told that the recipes are quick and simple. Watermelon rinds, lime leftovers, onions, chilli, and high-quality salt (Timorese, of course). One of the things changing is the food studio itself. After just two years, the place is well-integrated into Dili, feeding a large community of regulars and collaborating with several institutions like the (former) President’s Nutrition Award Program (PNP), PARCIC Aroma Timor, the Japan International Cooperation Agency, Market Development Facility, and Oxfam Timor-Leste. Most remarkably, Agora employs 23 people, including cooks and servers, administrators and educators. The experienced staff, like baristas Tozy Goncalves and Julia Ximenes, now train the newer folks on cupping (coffee tasting), quality control, and brewing. Chef Lucia Fernandes, sous-chef Nuqy Ximenes, and baker Julio Da Cunha oversee the kitchen work, planning and executing weekly menus of seasonal offerings, in which plant-based foods are foregrounded. They make refined dishes that are both familiar and wholly original—here a “katupa set” (Timorese steamed black rice with a Japanese-ish, bento-like set of accompaniments), there a trio of Greek-inspired “meze” (in which Mediterranean heritage meets equatorial taste). 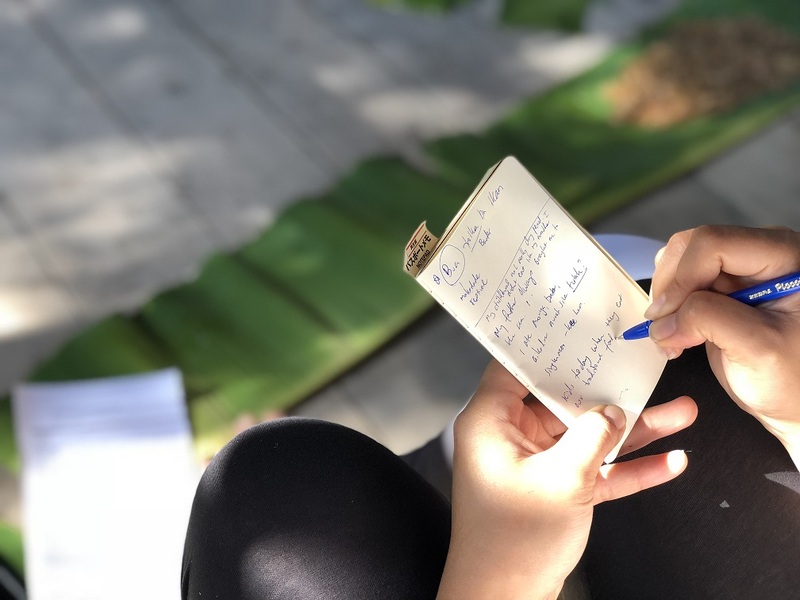 As new staff arrive, they find their own places in the studio community: innovators or mechanics or gracious hosts, passionate about fruit and cassava, and even cleaning and composting. 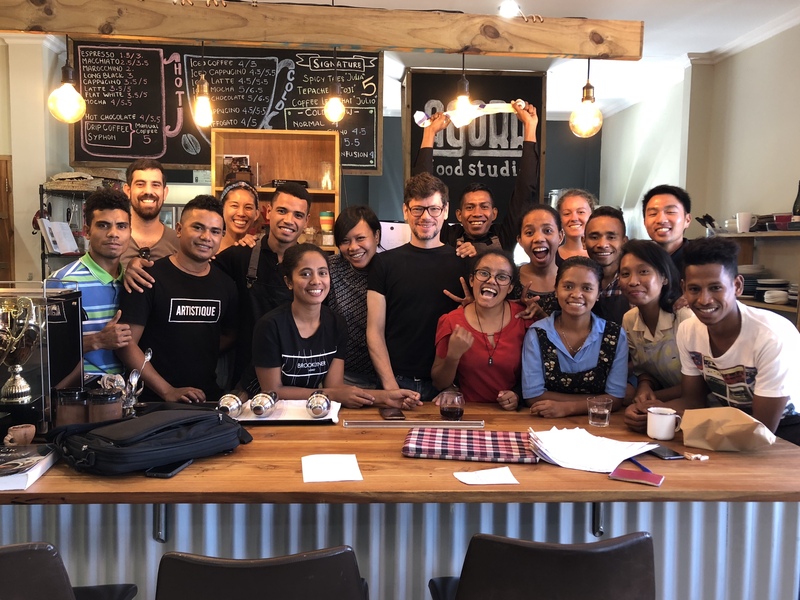 But what happens within the walls of Agora are just some of the ways in which the extended Agora team is working to boost interest in Timorese food. Alva’s business partner and husband, Mark Notaras, now heads up the Timor-Leste Food Innovators Exchange (TLFIX), a six-month pilot project funded by the innovationXchange program (emerging from LAUNCH Food, a program supported by Australia’s Department of Foreign Affairs and Trade and USAID). This inspiring effort picks up on a food innovation concept tested a year earlier, in conjunction with the PNP. 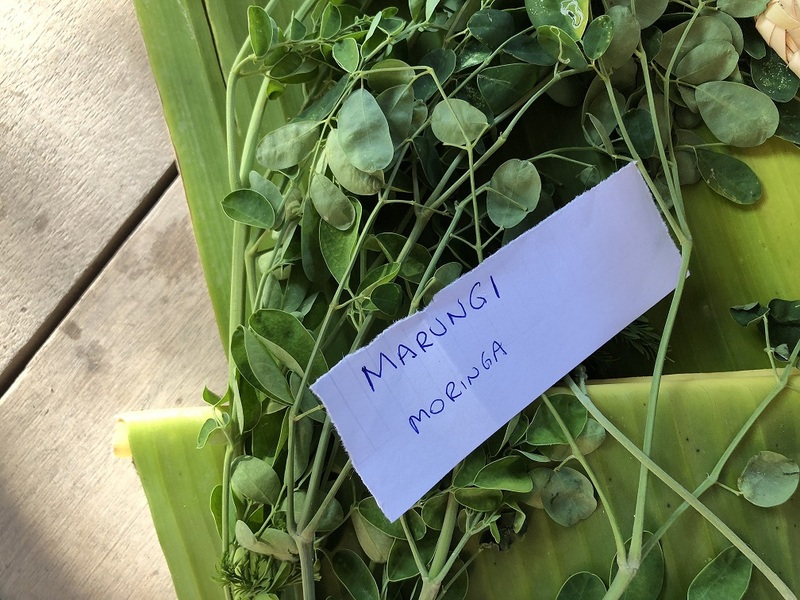 It is also the reason I have come to Dili for an all-too-short visit, and may well be one of the most important and well thought-out food interventions I have come across. After more than ten years in food systems research and teaching, I am bowled over by the thoughtful and holistic approach they are taking. TLFIX is now about midway through their initial funding cycle. Mark coordinates a team of advisors, researchers, and facilitators, including former Agoran Safira Guterres, project manager Josh Fernandes, researcher Luke Simmons, and policy lead Filipe Da Costa. This phase of the work uses market surveys and storytelling techniques to bring attention to past and present food ingredients, preparations, processes, tools, and presentations. From there, and in collaboration with permaculturist and musician Eugenio (Ego) Lemos and the Agora team of cooks, bakers, infusers, baristas, and budu gurus, new dishes and products will be developed and tested. Eventually, the goal is to create opportunities that support local livelihoods, food-centered health and wellness, national culinary pride, and long-term agricultural resilience. 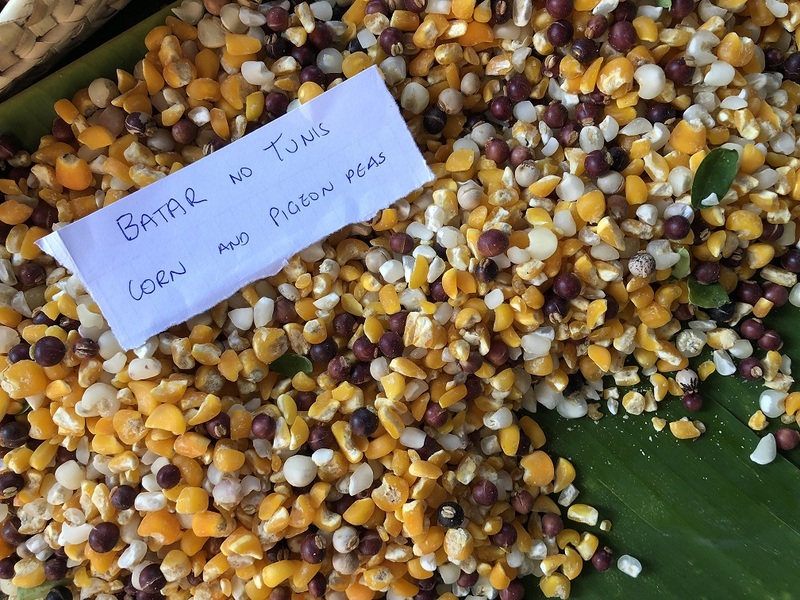 The project has several partners, and builds on previous collaborations with Timor-Leste’s National Nutrition Strategy and its Zero Hunger Action Plan. Because day-to-day foodways are not always considered valuable—being seen as humble and mundane—what is already present in a food culture often goes ignored. Storytelling is therefore a way to innovate from within, and is itself pretty innovative as a method. 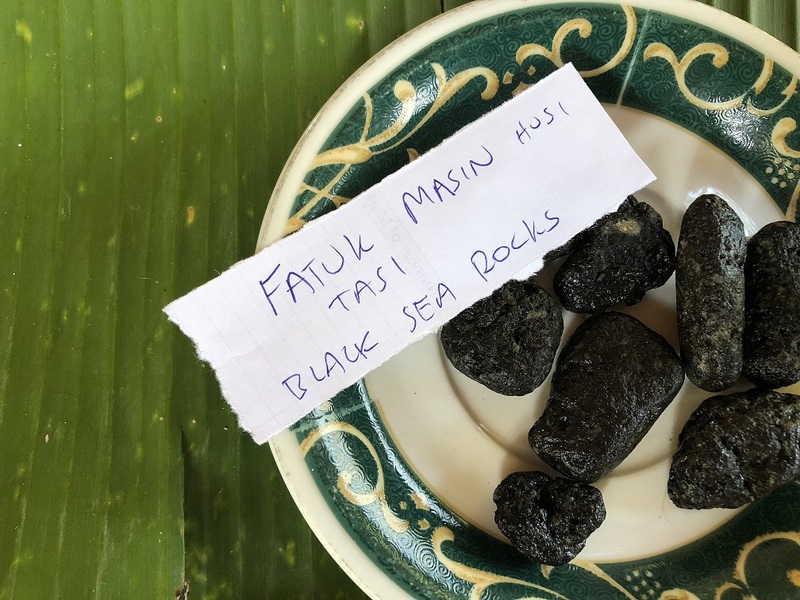 What is more, the act of telling about one’s food heritage (as well as facilitating groups of storytellers to come together and share food stories) can be an invaluable way to engender pride, power, and future sustainability. Through stories, cooks and gardeners and sellers become aware of how important their seemingly ‘ordinary’ knowledge can be. They witness their own participation in cultural heritage, while also recognising their stories as the means to describe and remember that culture. In the moment of storytelling, the past is connected with the future—a future that can be whatever the community chooses to create. At the same time, telling stories from Timor-Leste’s past is complicated. Violence and trauma can make remembering risky, and some people believe that to recall what was difficult might make it happen again. Just as much as the TLFIX team wants to help bring about a healthful and happy food future, konta istoria requires delving into a time that was anything but easy to swallow. Encouraging storytellers to share, to celebrate, and to take strength from their stories is therefore also part of the process. Fortunately, early results from two storytelling events already point to positive and productive momentum. The second of these two events took place during my recent visit to Timor-Leste, in the village of Vila on the island of Ataúro. 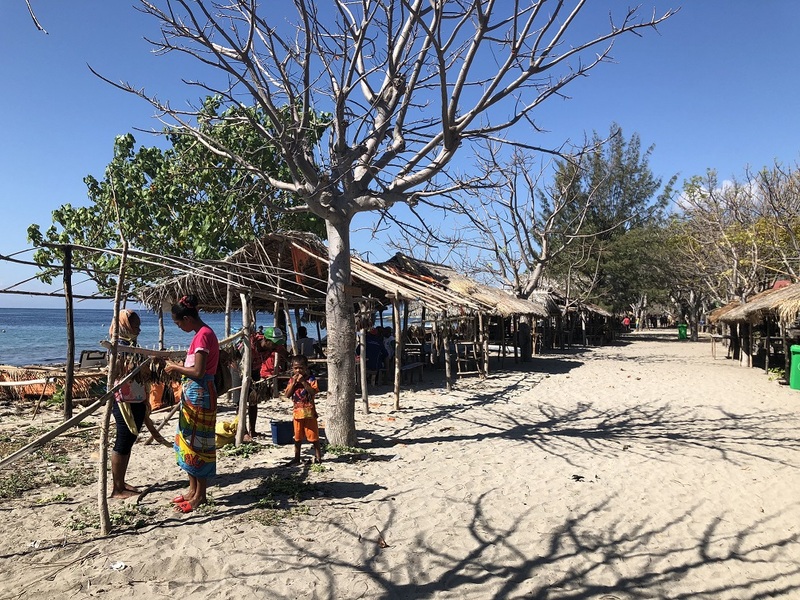 About one-and-a-half hours by boat from the port of Dili, Ataúro is now home to about 6,000 people (as well as four dialects and two religions). The open-air, slightly raised pavilion at Manukoko Rek, a restaurant-and-guest-cottage compound in the middle of town, served as our storytelling space. Once the five storytellers arrived from their respective villages of Vila, Beloi, Makili, Biqueli, and Makedade, we shared coffee, water, and pit-roasted kumbili, a giant ‘lesser yam’ with fluffy, ivory-hued flesh. We settled onto the wood-plank floors of the space, and helped Mery, Rogerio, Eu, Dina, Felizada, and Francisca arrange the edibles they had brought with them. Laid out on several giant banana leaves, these food props were also characters in the storytellers’ narratives. As they spoke, we learned their Tetun names: koto moruk (wild bitter beans), lehe (velvet beans), nu’u tein (boiled-down, lightly caramelized coconut), budu tasi kripik (seaweed-and-sago crackers), fatuk masin (jet-black salt rocks), marungi (the multipurpose greens known globally as moringa), batar no tunis (corn and pigeon peas), and sukaer musan u’ut (tamarind seed powder). The storytelling session at Manukoko Rek. Recounted in dialect-inflected Tetun, the stories were for me a way to see and sense—rather than ‘understand’—the storytellers’ words. Affect and gesture stood in for facts and meaning. While I might have caught a Portuguese-ish latin cognate from time to time, I mostly heard emotions and feelings, and watched hands gesture and brows furrow. It was another kind of account I was witnessing. Meanwhile, my more linguistically skilled colleagues wrote down notes aplenty—names of dishes, ways that they are prepared and presented, tools and techniques that were sometimes unique to a given place or time of year. We were all rapt. It has become an important idea for me. Said differently, when we weave a narrative, we transgress the geographic divisions of borders and boundaries. Stories blur these more-formal lines, while recalling what happened before they were drawn. Stories remind us that no time or place is ever truly separated from any other—and that by telling stories, we can reorganize the systems of power around us. That which was stable and dominant can suddenly loosen up. Storytelling is a political act. The night of the storytelling event, I felt intensely grateful for what I had witnessed. 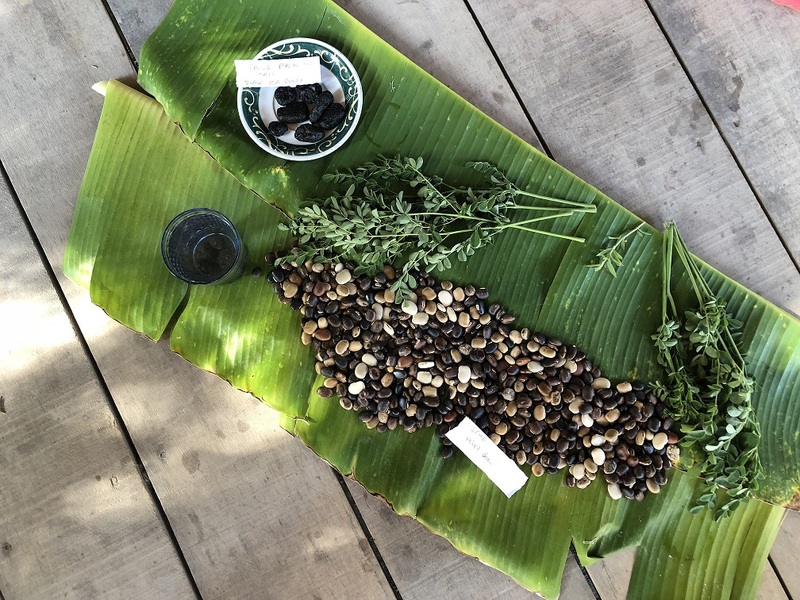 We ate many other memorable foods — toasted corn stew with beans and moringa; more chunks of fluffy and sustaining kumbili, topped with some juicy and addictive bilimbi (a kind of mini–star fruit that is pickled, budu-style). Grilled fish with lime. One or two beers, cold and simple. I found that I wanted to share some of my own food stories, and that I wanted the other TLFIXers to share theirs. Like the bilimbi, one taste of storytelling was not enough. Stories beget other stories, which demand responses, and those lead to yet more. Perhaps this is what will be left behind from this project, and what is so important about this type of work in general: food, sharing, telling, asking, listening, sensing. Repeat. Taking notes during the workshop. While we were waiting for the boat back to Dili the following morning, we remembered the palm wine we had bought at the market two days earlier. It was one of the many things stuffed into our bags and baskets; Alva thought we might want to check on it. Indeed, in the short time since buying the repurposed water bottle full of tua mutin, the beverage had undergone acetic fermentation, a secondary transformation that turns wine into vinegar. I recalled Alva’s earlier incantation about what can happen in Timor: things do change quickly here. A little while later, storyteller Francisca from the day before appeared with her husband and kids in tow. They were carrying coconuts for us to drink. It was a welcome gift, now that the water taxi was already an hour late and our throats were tingling with palm vinegar. The husks of the young coconuts were machete’d open, and we drank up the liquid with gusto. Several scrawny dogs from the market area came over to investigate, and their curiosity just might have been rewarded with bits of cooling coco flesh. Suddenly, there was the boat, and we were in it. Our parcels and packsacks were stowed, and a few more assertive types climbed up top with the captain, where we were treated to a visually expansive though rather turbulent crossing. The ocean zipped past, and too soon we were back on the industrial shores of Dili’s portside, wading through smallish bits of tide-tossed garbage and onto the slightly petroleum-streaked landing. Working beaches all seem to carry an internationally familiar griminess. To be sure that we were all learning as much as possible from each other, the team organised a continuing series of debriefs over the next twenty-four hours. Survey results were tabulated, while impressionistic analyses of what happened before, during, and after the storytelling event were exchanged. 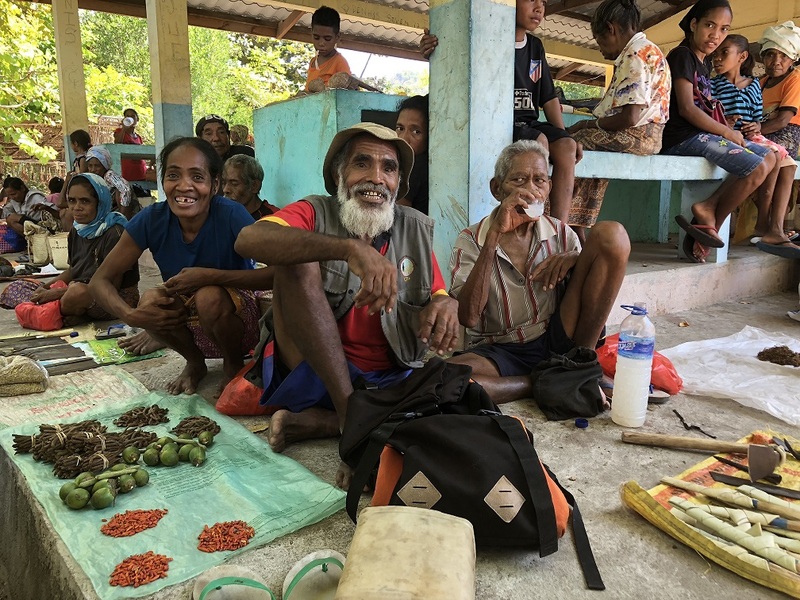 Yes, Timor-Leste has been beaten up by colonialists and invaders and occupiers, and yes, there are many people and places and things that need healing. But Timor-Leste is in no way a broken thing, waiting to be “fixed” by outsiders; repairing these histories is not what TL-FIX is about. But just as quickly as this concern arose, it also abated. I realised that “fixing” within this project actually means anchoring, solidifying, and grounding. It means fixing in place certain things that might otherwise slip: the pride that storytelling brings about, the new practices and procedures that a government can champion and support, the enactments by a nation’s people that create the next part of their future. In this sense, fixing means making connections and making a way for an ecology of good people and meaningful food to work and succeed together. On my final day in Dili, as I had a last flat white and taste of budu at Agora Food Studio, I felt an immense sadness to be leaving. Some thirty-six hours later, I would be back in my home city of Montreal. I would have bought a beautifully woven tais with crane and flower motifs, a book of photographic images, and some excellent Maubere Mountain Coffee. I would have a hand-made knife in a palm-frond scabbard, a baggie full of nu’u tein and one of seaweed kripik, some Timorese honey and peanut butter and coffee-husk tea (known as cascara). Mostly, however, I would have too many feelings and sensations about Timor-Leste to share in a lifetime. And stories, about the beans and bilimbi, the people and their power, the generosity of telling and listening, and the potential of creating a nation anew through the blending of taste, talent, teaching, and truth. The first time I was in Timor, in 2016, was for three days, and this time was only ten. To feel so transformed in such a short amount of time is powerful, enduring. But maybe not all that surprising, after all. As Alva expressed so very clearly after that first taste of budu on my first day back in Dili, things change quickly here. 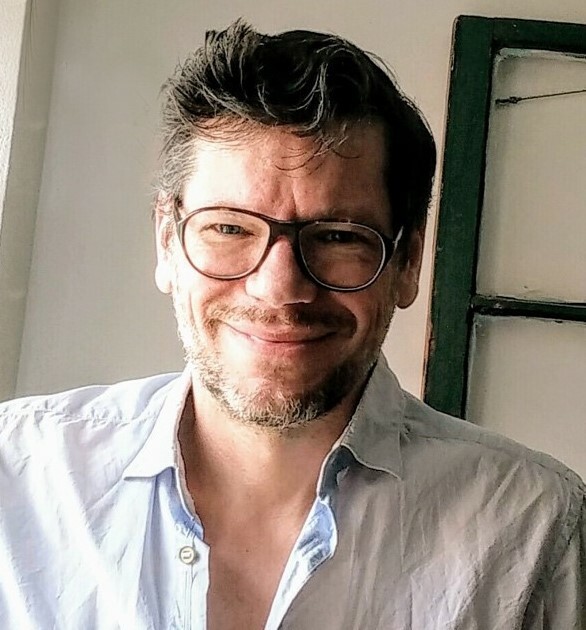 David Szanto is a communicator and educator whose work spans food, publishing, systems theory, art, and digital technologies. In 2015, he completed a PhD in eco-gastronomy, the first degree of its kind. He lives in Montreal, Québec, Canada. *This gathering did eventually take place, from September 15 to 18, 2018 in Biqueli village on Ataúro. The program included both food stories and tastings, as well as musical performances by Ego Lemos. Like spoken language, music both produces and is a product of culture, and therefore makes for a natural and formidable combination with food. The next steps for the project include imagining what comes after this intergenerational sharing, food product innovation, market testing, and policy influencing. The strategy needs to be complex, because education, governance, agriculture, cuisine, and activism all need to play with each other; like food, music, and culture, they are interdependent. Amazing and magical! A place I have never been but have loved imagining it there, and as I read can pretend I was there with these people, talking, listening, and all creating such important work together.